100% Durum Wheat Semolina Enriched Macaroni Product!! Made in the world's pasta capital: "Gragnano," Italy!! Bag: 500 gr / 1.1 lb. Ingredients: durum wheat semolina, water. 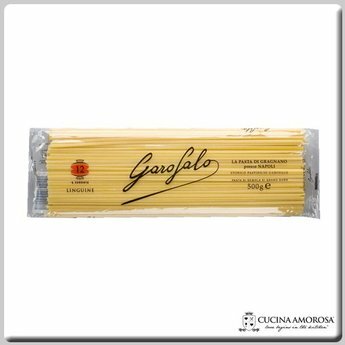 The Pasta Maker Lucio Garofalo had made pasta for over 200 years in the town of Gragnano. The town was named for the wheat (grano). Fresh spring water, sunny weather and the nearby sea make this hill the perfect area in all of Italy for making pasta. Lucio Garofalo is proud of his pasta and knows that you will enjoy it.